Moon Position: 12°51’27" – 25°42’52" Cancer Moon Sign. It is unfortunate house. But in order to make a final conclusion, it should explore aspektarium Moon with other planets and the elements of the horoscope, and also take into account the gender of the individual, as the impact of the house on the male gender is much more favorable than on the female. This is reflected in all spheres of life - work, social, conjugal. People with this position of the Moon are of two types. One of them is endowed with a philosophical mind, it has a religious worldview. It is distinguished by the nobility, generosity, they are fair and friendly. Their chief judge - his own conscience. Since childhood is interested in science, he is engaged in research surveys, interested in the occult, astrology, magic. It attracts the secrets of nature, the universe, the mysteries of the human brain and body. Often, he is endowed with phenomenal or psychic abilities that develop throughout life and is lifelong. But he too overactive imagination, soft, gentle soul, so it is too romantic, emotional, and depends on the mood. Another type of a rationalist, it is distinguished by intelligence, prudence, lust for power, unscrupulousness achieve the objectives. If the Moon has a strong negative aspects, this type of egoist and hypocrite, a great sinner on many items. In the world of a man he looks only with its bell tower and acts, guided only by their own interests. His life will change and frustration, a lot of meetings and partings are also many, and the mysteries and secrets will accompany the end of life. He is contraindicated tour and travel, as well as commercial, political and social activities. The best option seems secluded lifestyle. This type of single mother or father. 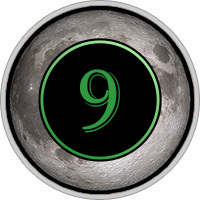 Lunar Ascendant This house is considered to be an unfavorable indicator: prominence to negative traits, negative impact on relationships with others, cooperation, married life. Such a person is undisciplined, a liar, a deceiver reputed, adventurer, rude, impudent, a man with no brakes and, with additional performance is even able to commit a crime. 1st Quarter of 9 Moon House. Wrong place for the moon. A particularly negative effect on marriage and married life, the relationship with the children, relatives, friends. 2nd Quarter of 9 Moon House. Successful. Prudence, generosity, fame, honor, fame, mystery, wealth, a happy ending life. 3rd Quarter of 9 Moon House. Great knowledge, but the harmful nature, quarrelsome disposition, the tendency to set up others against themselves. 4th Quarter of 9 Moon House. Excessive passion, bad habits, increased interest in the opposite gender, sexual indiscretions, leading to tragic consequences.